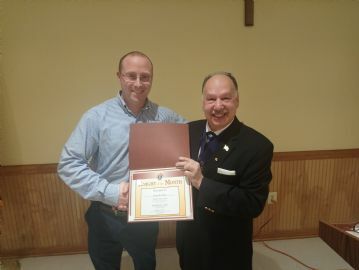 Brian Pettit named Knight of the Month for February 2019 recognizing his service to St. Francis parish organizing and leading the annual Christmas sale in November and December 2019. 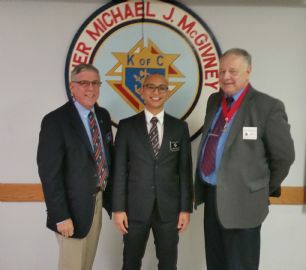 Brother Afatswo Lartevi participated in the Knighthood Exemplification at Rosensteel Home Saturday January 13, 2018 with GK Day and FS Willer observing. State KofC event at Hershey Park Sunday April 28 10AM-6PM; $34 per person (regular $69.80). SFoA Rebuilding Montgomery Project Saturday April 27. Council point of contact: Mike Rogewitz. Annual dues: Second notices have been sent by letter and e-mail for Columbian Year 2018-2019 dues. 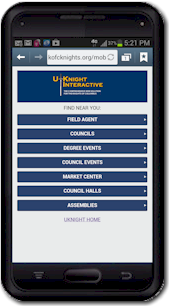 Pay the dues ($45 if only one year) to Financial Secretary Steve Willer by mail or at a Council meeting or pay on this web site using Pay Pal or a credit card; go to the News & Announcements Screen. Click here to pay your dues by Pay Pal or credit card. EYE GLASS CAMPAIGN: Please continue to turn in your old glasses, even sun glasses, at the Hall (box located at the end of the bar). If you have any questions, please contact Mike Thomas at (301) 330-5970 or cinnabarmike@verizon.net. PULL TABS: Under the leadership of Dan Koscinski, the Council collects and donates pull tabs for The Children’s Inn at NIH, a residential “Place Like Home’’ for families with children participating in leading-edge research studies at the National Institutes of Health (NIH) in Bethesda, Maryland. Bring your tabs to Father Cuddy Hall and place them in the containers inside on the right.